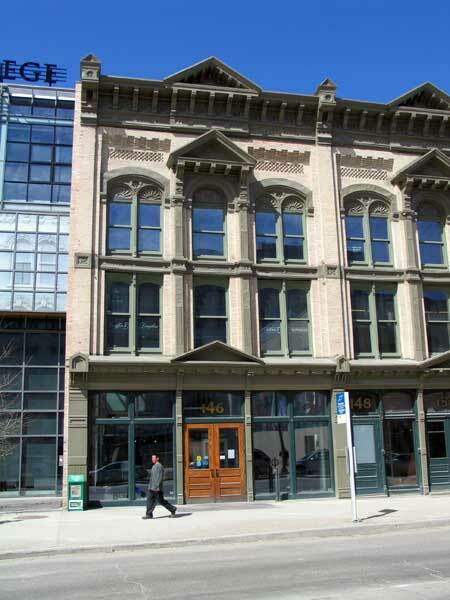 Originally called the Benson Block, this building was the twin to the Bawlf Block at 148 Princess, both of which were constructed in 1882 for liveryman Joseph Benson and grain merchant Nicholas Bawlf, on a design by local architect brothers C. A. Barber and E. W. Barber. The former building was first occupied by the wholesale grocery firm of Griffin and Douglas. It had a succession of names and functions through the years, including several stints as a hotel (Globe Hotel from 1894 to 1904, Market Hotel from 1904 to 1917, Market Hotel from 1925 to 1937, Bank Hotel from 1937 to 1944, and Drake Hotel from 1944 to 1974) and a period as an office block and warehouse between 1917 and 1925. The Benson and Bawlf buildings were both demolished in 2003 to make way for the downtown campus of the Red River College although their exterior façades were retained. In 2004, the building (a municipally-designated historic site) was recognized with a Heritage Winnipeg Preservation Award. Drake Hotel / Benson Block (146 Princess Street), City of Winnipeg Historical Buildings Committee, June 1979.